Attend a yoga day retreat, weekend break or a holiday for time to focus on you, your practice and relaxation. I run occasional weekend workshops, sometimes with visiting teachers. Most of these are hosted at Maitri Studio, where other (non-yoga) workshops are also listed. You can book my own workshops through the booking form, or other events by following the links. Aisling Guirke's monthly 3-hour workshops for teachers and students with a strong practice are on: May 8th and June 5th 2019. In these 2.5hr workshops we have more time to dive into the practice, often on the Pune cycle (standings, forward extensions, back extensions, restorative/pranayama) but linked to the whole suite of poses. Choose the workshop pass from the drop-down on the buy page, and register for the workshop/s you wish to attend. Saturday 15 June 10am-12.30pm - something lively for summer! UPDATE: NOW FULL! Contact me if you’d like to be on waiting list in case of cancellations. 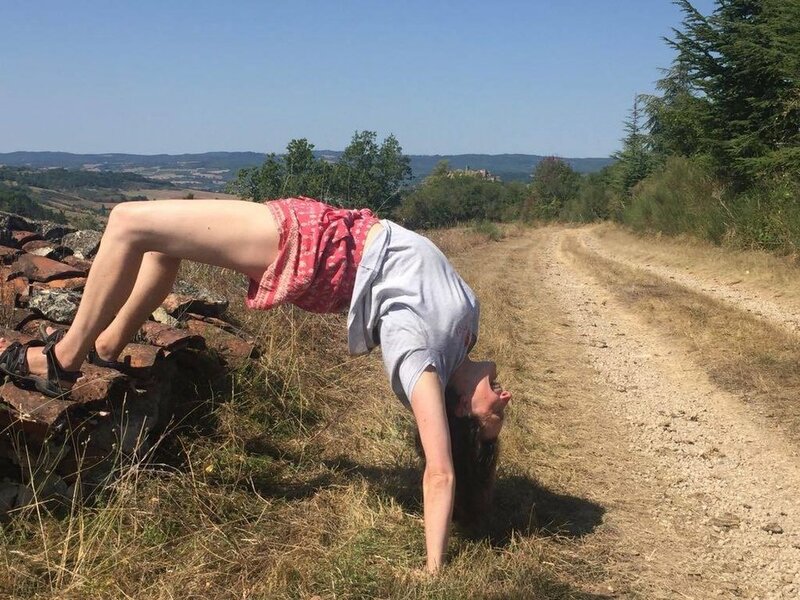 It’s official, we’re heading back to Mas de Monges at Cordes-sur-Ciel for another couple of weeks of deeply relaxing and nourishing yoga and holiday. Read the information sheet with details here. Prices remain the same as last year: £150 deposit (or £175 if attending both weeks) with €650/750 per week balance (twin/single). I run the occasional weekend retreat in Northern Ireland or nearby, either on my own or with others. It’ll all be posted here when confirmed. Following our second successful retreat in February 2019, Veronica of Mindfulness Connected Learning and I are likely to do another joint yoga & mindfulness retreat sometime, as soon as our diaries permit. Join me and other teachers from Maitri Studio and across Northern Ireland fr the Ulster University MindYourMood sun salutation challenge and free taster classes taking place on all four UU campuses. Read more here and book online. Join me and Veronica Ellis of Mindfulness Connected Learning for a guided mindfulness walk and then some outdoor yoga at the beautiful Carnmoney Hill Woodland Trust reserve just north of Belfast. £20 Booking online essential.